Long Time No Sea is a great choice for a quiet, relaxing oceanfront vacation! This home in the Ocean Drive section can comfortably accommodate up to 16 people with its 6 bedrooms and plenty of room. 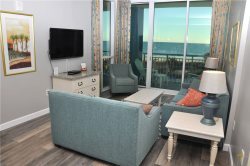 Enjoy the Ocean Drive Difference by starting your vacation immediately upon arrival, as this property comes with fresh bed linens/bath towels, the beds are already made up for you, and the departure maid service are all included in your price. The upstairs features 5 bedrooms, a big living room with flat screen TV, dining area with extra seating, two bathrooms, and a large kitchen with lots of counter space and natural light from the many windows. The dual master bedrooms offer ocean views, deck access, cable TV, and bath access. One of the master bedrooms even has a private oceanfront balcony! The downstairs bedroom has 2 twin beds and a private bath. Outside, you'll find a yard to play in, charcoal grill, lots of deck space in the front and rear, a porch swing, and a private beach access. There is plenty of parking space and 2 private showers for washing off after a long day at the beach. Rent this home today for your summer vacation, sports team, family reunion, or wedding. You'll be close to all the great attractions in Myrtle Beach, and Main St is a short walk away! There you'll find pubs, restaurants, beach stores and boutique shops. Guests who rent Long Time No Sea will have free access to pools, hot tubs, lazy river and more at Ocean Drive Resort just 6 blocks away! You won't need a private pool when you have access to these great amenities.